BBC Gameshow 'Pressure Pad' is looking for contestants. You can apply online or you can head to the Wellgate shopping Centre in Dundee on Friday, 11th April between 10am and 5pm. Contestants must be over 18. The show itself is recorded at The BBC's studios at Pacific Quay in Glasgow. 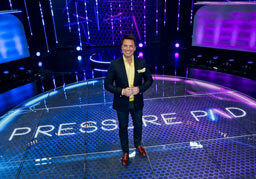 Pressure Pad, hosted by John Barrowman, sees two teams of five compete across a series of general knowledge games, with the aim of getting as many of their teammates into the final as possible. The more players you have in the final the better your chances of winning the cash prize. They're looking for contestants with lively, intelligent and competitive personalities to take part. Read more and get in touch through this BBC link for an application form. Pressure Pad is produced for the BBC by 12 Yard Productions.